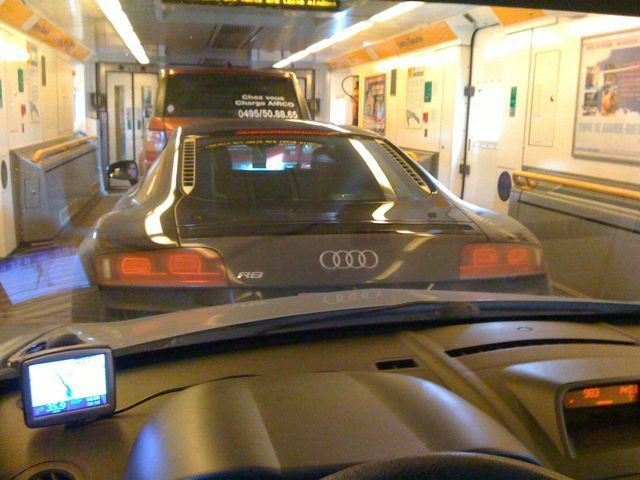 just on my way back through the Channel Tunnel. the car in front isn’t designed with this in mind. An Audi A8 supercar is only 4cm narrower in the wheelbase than the tracks you’re given to drive in. The guy managed not to hit anything. Quite a feat actually. Massively lazy day today. The trade show time warp is upon me, and I need a little time to recover. Sleeping was paramount, then wading through emails. I feel no guilt for working a half day, as Sunday was spent talking product. Time out and away from the everydayness of emails and ordering is also good to try to categorise and prioritise the discussions and suggestions that come out of any show / visit. This is the difficult thing as there are so many different ideas, and so many different things that occur and opportunities that arise. In all of the excitement of it, other things can get lost. At the show over the past couple of days, I met and go to know the international sales managers for a couple of different brands. One of whom I gave a lift to the airport today. She is young – a lot younger than me. Also a lot smarter. At 22 she is in a similar position to me at 30. Traveling from the States alone, it was her first time in England and on business, and only for a couple of days. I know what this is like. And I also have experienced the ‘just passing through’ feeling of visiting a place, and yet never having seen any of it, or nothing apart from ‘work’. It is also difficult to know where to start, especially if you only have a few hours to spare. The choice is crippling in my experience. I had this feeling in Tokyo. So, I took her to a few places. A proper English pub for a quick beer, and then on to Eton and Windsor. It was a whistle stop tour taking in Eton College, and Windsor Castle. We did it in about two hours, and it was good fun. I hope that it made her visit just a little more interesting. It also made me think about how nice it actually is around here. Sometimes it is easy to forget what you have on your doorstep. Well the show today has mostly been about talking to different retailers about our products, and trying to understand ways in which we can see more sold. It isn’t as easy as you would think, as there is such a think as quality as well as quantity of sales. I had a very interesting chat with another brand about what the longterm wish is of our brands and our partners. Without going into detail, it was food for thought. I also managed to have a bit of a walk around and look at some of the products that may have passed me by in the past. 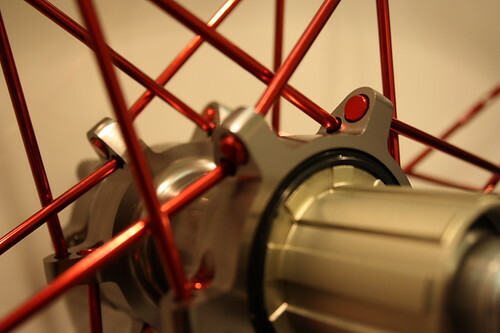 It was good to see the Lew / Reynolds wheels in the flesh again, looking a lot better (although not perfectly) finished than the set I had in my hands at the Sea Otter festival a couple of years ago. Good to see another product in this market, along with Lightweight and Mavic, although at £4000 a pair I can’t imagine even industry people at cost chosing these over the competition. 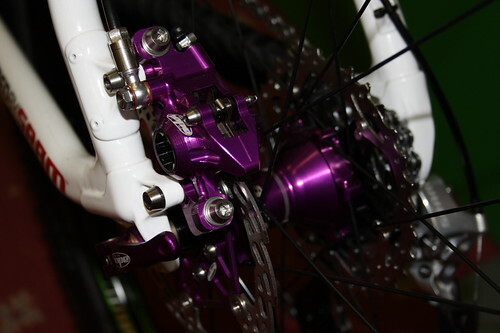 The design genius, churning out beautiful items at CrankBrothers is obviously still with them. 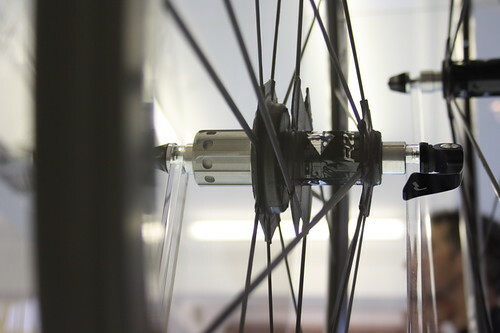 I have heard good reports on the wheels, but only from ‘insiders’. I would be interested to hear from any owners. The price has come down too I was told by the UK distributor. They cost a damn lot less than the Reynolds for something far prettier in my opinion. Speaking of pretty I am not sure who is going for the purple bits on this bike, but it reminded me of the 90s. 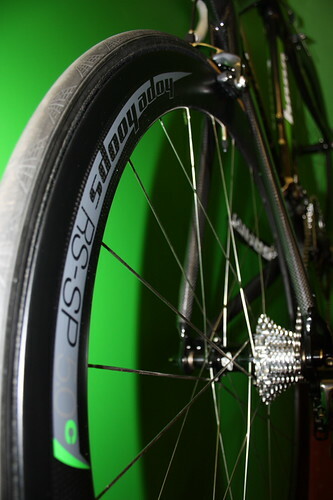 Hope’s road wheels also look nice, although I know nothing about them! I failed to ask too. FAIL. The gents at Buff had also done interesting things with their hotel conference room. Finally this caught my eye. 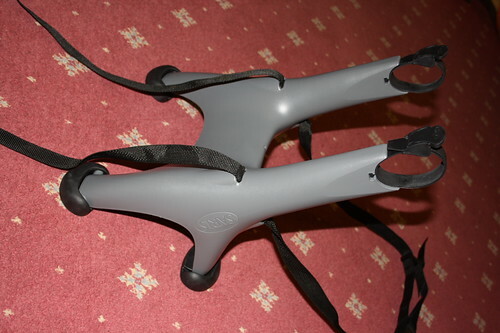 At £40 approx, this looks just perfect for throwing the bike on the back of the car, and is light enough and small enough to keep inside the car. I have a Saris Bones that is very secure. As such, I expect good things of this. 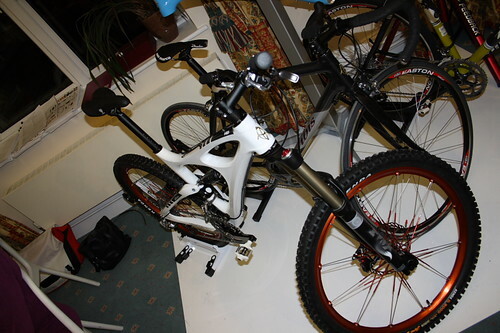 A lot more here, including the brand new Ibis, a Colnago and Arsis shifting, just click the pic. Today I am at core bike, a show specifically for distributors and retailers. It is kept deliberately small, and takes place in a hotel right near the Silverstone Racing Circuit. Whittlebury Hall is the venue, and the event takes place over 3 days. Represented here are most big brands, but not all (Shimano is not here, for example, and nor, to my knowledge are SRAM). 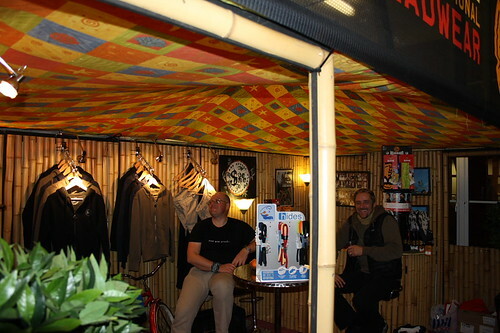 The show is an opportunity for the distributors of products to talk directly to the retailers. It is a sales show, in that respect, rather than something like Eurobike which, from my point of view is more about presenting new products and whetting the appetite of the end users via the press, while we have the opportunity to catch up with all of the distributors Worldwide, who tend to chose that show as being the one to attend. Here, it is far more personal, and many brands have representatives helping their distributors. For the local retailers, this is a massive thing, as it is unusual to have someone from the brand there answering questions. The show lasts for three days, and is organised in the most part my Patrick Adams (of Mountain Mayhem and Sleepless In the Saddle fame). His contacts within the industry proving that he still knows how to put on a very good even and can get the right people there, at the right time. I am presenting our brand for the distributor, and it is a good opportunity to exchange ideas with their sales staff. I will try to get a lot of photos today. Great ride today with Danny, a friend of mine with a bike and cycling obsession for which I am partly responsible. I met him originally through the Weight Weenies website. It has been a couple of years since we rode together, and back then it was mountain bikes. Now, following my putting him in touch with someone selling a high end road bike, we were on the road. What a difference a couple of years makes. He was just so strong. He has started racing, and was full of the Hillingdon circuit and his experiences there. It was really enjoyable to just be out riding for that long, and the 3.5hours plus that we were in the saddle didn’t feel like that at all. Now, I am knackered and in bed. Tomorrow is Core Bike so this will see me taking a couple of days away from the bike. I think that this will be good because the right knee is letting me know it is there. I have had problems before, have custom footbeds made and found this to help. 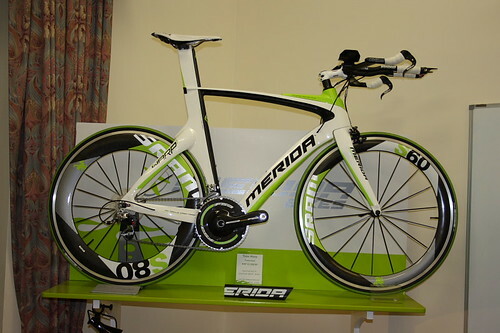 I am thinking that a proper bike fit is the way to go, as previous MRIs and X-Rays have found nothing wrong. As I said, it doesn’t hurt, but it lets me know that it is there, which is a little unnerving. Anyone have any suggestions here please? At home in the UK, I often go to the Great Park in Windsor. Technically this is a private estate (a Royal estate) but is open to the public. It is a great place to ride, allowing a loop of about 4 – 5 miles to be ridden on essentially what are closed roads. You need to look out for walkers, but it is nice just not to have cars baring down on you. Last night I decided than rather than trying my first training session on the rollers, I would go and ride in the park, using my high powered Exposure lights. I set off in rush hour traffic with the sole thought being that once I am in the park it would be a lot nicer. I got there looking forward to doing three, maybe four laps. A the gate a warden stopped me (or should that be guard?) and told me that the park was actually closed during the hours of darkness. Something about health and safety. In fairness to him, he said that he would have let me ride it tonight, provided that I didn’t do it in the future. He did say that there were three other wardens patrolling and so it was likely I will get stopped again. I actually can completely understand where they are coming from, but it is just a little upsetting. There are a shortage of quiet roads around here where you can just concentrate on technique and nothing else. It isn’t a massive issue, I will just have to ride in the middle of the day instead, but it does curtail my options a little. Did an hour and a bit anyway, and road a canal tow path today for a bit. That is three rides in three days. I am not Lance yet (or even Yolanda for that matter) but I am feeling better about myself. I thought tomorrow is about time that I tried slack-lining again.